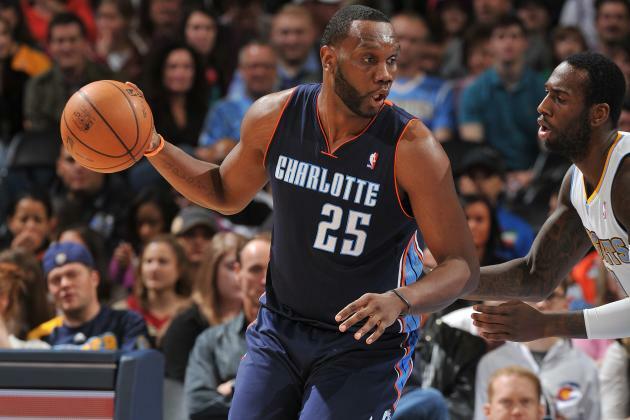 Charlotte Bobcats centre Al Jefferson and Dallas Mavericks forward Dirk Nowitzki have been named the Eastern and Western Conference Players of the Week, respectively, for the games played Mar. 31 – Apr. 6. Al Jefferson led the Cats to a 4-0 week as they clinched their second playoff berth in franchise history. Charlotte Bobcats pivot Al Jefferson makes his second appearance as the Eastern Conference Player of the Week (fresh off selection as the Eastern Conference Player of the Month) in the last four weeks after carrying his team to a 4-0 record over the past seven days. On the back of Jefferson’s player (24.3 points (fourth in the conference), 13.0 rebounds (second) and 1.3 blocks per game (tied fifth) while shooting 48.1% from the field and 79.2% from the stripe) the Bobcats clinched their second playoff berth in franchise history – the Cats currently hold the seventh seed and are only one game behind the sixth-seeded Wizards. Jefferson notched a double-double in each of his four games, scoring at least 24 points in three contests and grabbing at least 15 rebounds twice. This is the seventh Player of the Week award of Jefferson’s career. Mar. 31 vs Washington: 19 points (8-19 FG and 3-3 FT), 11 rebounds and two blocks in a 100-94 win. Apr. 2 @ Philadelphia: 25 points (9-17 FG and 7-10 FT) and 10 rebounds in a 123-93 win. Apr. 4 vs Orlando: 29 points (13-24 FG and 3-3 FT), 16 rebounds and one block in a 91-80 win. Apr. 5 @ Cleveland: 24 points (9-21 FG and 6-8 FT), 15 rebounds, four assists, one steal and two blocks in a 96-94 overtime win. 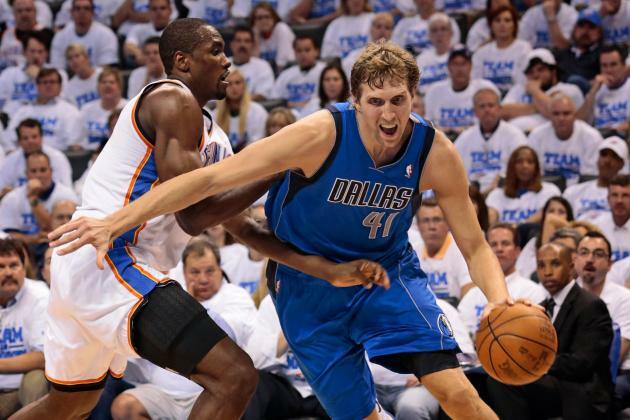 Dirk Nowitzki’s sharpshooting helped the Mavs to a 3-1 week and back into the playoff mix out West. Dallas Mavericks power forward Dirk Nowiwtzki has been selected as the Western Conference Player of the Week after leading his team to a 3-1 week thanks to a hot shooting hand between Mar. 31 – Apr. 6. Over his four-game schedule, Nowitzki averaged 25.3 points (fourth in the conference), 8.0 rebounds, 3.0 assists and 1.0 steals per game. The big German also enjoyed an efficient week shooting the ball, hitting 55.7% of his field goal attempts and 56.5% of his shots from beyond the arc (seventh in the conference). He also notched two double-doubles over the week, falling just one rebound shy of a third against the Lakers. Nowitzki’s stellar shooting helped keep the Mavericks in the thick of things as seeding for the playoffs in the Western Conference comes down to the wire. The Mavs current sit seventh in the West (47-31) and are one-and-a-half games clear of the ninth placed Memphis Grizzlies. This is Dirk’s first selection as Player of the Week this season (the 16th of his career) and his first nomination since 2010. Apr. 1 vs Golden State: 33 points (13-21 FG, 6-8 3FG and 1-3 FT), 11 rebounds, three assists, two steals and one block in a 120-122 loss. Apr. 3 @ Los Angeles Clippers: 26 points (10-18 FG, 4.7 3FG and 2-2 FT), 11 rebounds, one assists, two steals and one block in a 113-107 win. Apr. 4 @ Los Angeles Lakers: 27 points (11-14 FG, 1-2 3FG and 4-5 FT), nine rebounds and five assists in a 107-95 win. Apr. 6 @ Sacramento: 15 points (5-17 FG, 2-6 3FG and 3-4 FT), one rebound, three assists and one block in a 93-91 win.